Size 6, 7, 8, 9, 10, 11 whole sizes only. Please request ring size by choosing from the drop down menu at the top of the listing. Wide rings run small! We recommend a size larger in this particular ring since it is a wide style! 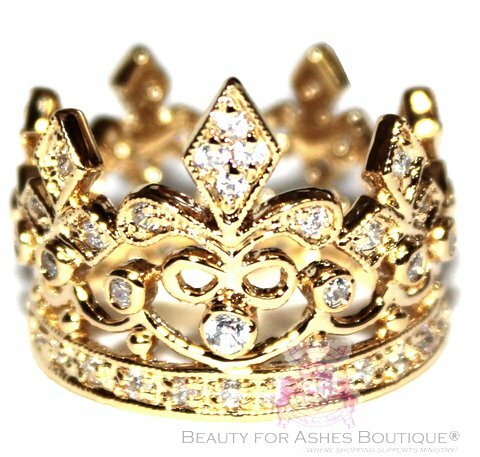 Show everyone you're the Princess of the King of Kings with the Royalty Princess Ring. This beautiful eternity style band features genuine cubic zirconias in clear, channel, bezel, and pave set. The centerpiece of the crown is a Fleur De Lis. This ring has a solid brass base with an electroplating of several layers of yellow gold, which is very durable, and gives a shiny finish without tarnish. If you want a longer lasting fashion ring to wear daily, we will be carrying this ring in sterling silver with white gold soon for a higher cost.